Argentina overcame heavy rain and a dogged Italy side as they recorded a 19-14 victory in an error-strewn encounter in Rome. Nicholas Sanchez booted 14 points, with Juan Imhoff crossing for the vital try in an encounter which was punctuated by mistakes from both sides, thanks in large part to the wet conditions. Tommaso Allan kicked three penalties for the home team with Michele Campagnaro scoring their try as they ended the autumn campaign with a second defeat. 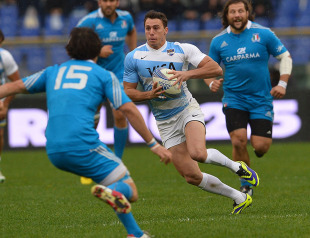 Allan came in at fly-half to make his first Test start for Italy replacing Luciano Orquera who dropped to the bench. Luca Morisi was missing after having his spleen removed meaning Gonzalo Canale moved to inside centre with Campagnaro joining him up the middle while Robert Barbieri replaced Mauro Bergamasco at openside. Mariano Galarza and Benjamin Macome both joined Argentina's forward ranks with Imhoff and Lucas Gonzalez Amorosino coming onto the wing and Gabriel Ascarate was drafted in at centre. It took Allan just five minutes to get Italy on the board as the Pumas were penalised at the scrum and the former Scotland Under-20 international made no mistake with his opening kick at goal.Argentina then began to apply some pressure with some good ball-carrying inside the 22 but Italy's defence stood firm. Scrum-half Martin Landajo was determined to make the best of Argentina's early dominance and made an impressive break for the line but was eventually stopped 10 metres short. Allan pulled a kick wide when handed the chance to extend the lead after 15 minutes but he would not make the same mistake twice and it was 6-0 four minutes later when Sanchez strayed offside. The South Americans did not take long to hit back, though, and Imhoff went over for their first try after 21 minutes. Macome gained territory from a scrum and when the ball came out of the ruck Imhoff was on hand to beat Edoardo Gori and touch down in the corner with Sanchez adding the extras. Argentina's lead was to last just three minutes as Allan landed his third penalty soon after to hand Italy back their advantage at 9-7. Sanchez moved the Pumas back ahead by a point at the break with his first penalty but Allan was short with two shots at goal in the closing moments of the opening period. Allan made it three misses in a row after the interval and Sanchez made him pay as he extended the lead to four from the tee. Italy needed to get a foothold in the game again and talisman Sergio Parisse was nearly the man to provide it but he was stopped on the line by Martin Bustos. The home side would get their try after 62 minutes thanks to Campagnaro who beat Imhoff to Allan's cross-field kick to touch down and the Azzurri were ahead again. Both sides were struggling with discipline and Sanchez came up short with one penalty before nailing a 68th-minute effort. Six minutes from time Sanchez's boot opened up a five-point gap with a drop goal but Italy continued to press with Canale eventually knocking on a Parisse pass. 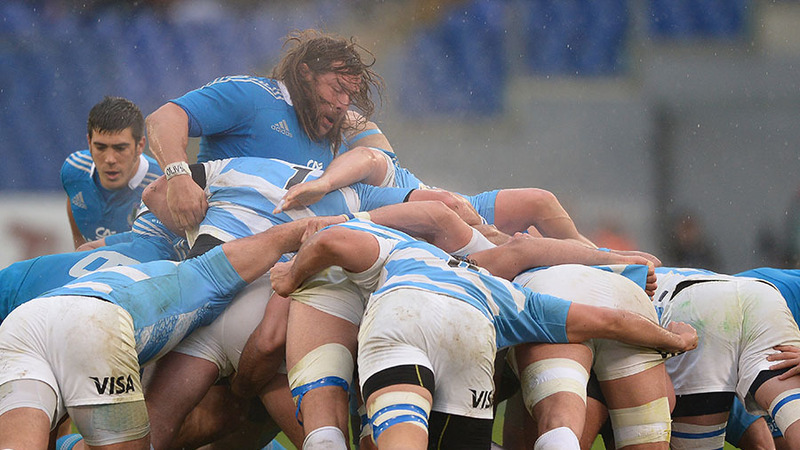 They could not find a way through, however, and Argentina ended their year with a win.